A tradition attests that the two Apostles went to evangelize Armenia and Persia, and that they suffered martyrdom in the city of Suanir in the year 47. 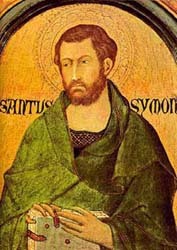 St. Simon was also called the Zealot, probably because he had been a member of the nationalist party of Zealots who refused to recognize any foreign yoke over Palestine. The mother of St. Jude Thaddeus was Mary of Cleophas, a sister-in-law of the Blessed Virgin, who with the Virgin Mary stood by the Cross of Jesus on Calvary. His father was Cleophas [Clopas or Alpheo in Aramaic], a brother of St. Joseph. Therefore, he was the legal cousin of the Man-God. Jude was one of those that his fellow countrymen called a “brother” of the Son of the Carpenter, because it was a custom among the Jews at that time to call cousins brothers. He wrote an epistle to combat the Gnostic heresy, which was just beginning to appear. In 1605, the relics of the two Apostles were transported to the Vatican Basilica and placed in a crypt under the Altar of the Crucifixion. Tradition tells us this was the site where the cross of St. Peter once stood. St. Semin’s Basilica in Toulouse, France, also has some of their relics. There are several facts worthy of consideration in this selection. 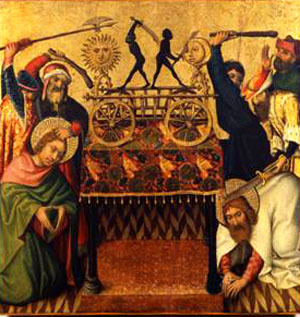 The first is the fact that St. Simon was called the Zealot. The Zealots were those who had a especial zeal for the independence of the Palestine, that is, they did not want the Holy Land to fall into the hands of any pagans whatsoever. Since the Zealot cause had some good points – commendable in some aspects – we understand why Our Lord recruited one of His Apostles from its numbers. St. Jude was the cousin of Our Lord. He was not the only cousin: St. James the Lesser was also His cousin. It seems that St. James the Greater and St. John were also closely related to Jesus Christ. This shows the extraordinary predestination of the race of David. If just one Apostle belonged to this race, that would have been enough to immortalize it. However, to demonstrate His love for the stock of David, not only did God choose to descend from this race, but He chose most of the Apostles from it. It also shows God’s consideration for legacy. We see the lack of wisdom and absurdity of these egalitarian persons who attack the principle of inheritance in society. This erroneous position can be refuted by thousands of episodes in Scriptures. St. Jude is the patron saint of desperate causes, the patron of the impossible. Many times in our counter-revolutionary life we feel the disproportion of our means in relation to those of the Revolution that we are called to destroy. To some of us it may appear impossible to win this battle. So, when a temptation of discouragement assaults us, we should have recourse to St. Jude. In our days we are witnessing the usurpation of Holy Mother Church by Progressivism, which is a doctrine different from Catholic doctrine. We should ask St. Simon to communicate to us the zeal he showed for the Holy Land. With his zeal we should fight any impure doctrine that exists in the Church and expel it from her bosom. Thus, on this day when we commemorate the martyrdom of these two illustrious Apostles, we should ask St. Jude to restore our courage for the fight against the Revolution. Then, we should ask for St. Simon’s zeal so that this renewed courage will become a blazing torch against the enemies of the Holy Church.